The Kia Sportage has been around nearly 25 years, long enough to make millions of lasting memories. Sportage owners are a loyal bunch, and they keep coming back for more of this spirited small SUV that has captured America's imagination. The 2016 Sportage is chock-full of eye-catching style, a fearsome new turbo engine, responsive handling, and great value, and it's backed by a very generous warranty. If you have fond memories of the Kia Sportage, you should stop by Cumberland Kia to see the 2016 model, for two good reasons. The first is Peter Schreyer, the dynamic new Head of Design at Kia who has shaken up the whole industry with brilliant styling and head-turning concepts. So far he has breathed new life into the whole Kia lineup, with close-set headlights highlighting the bold Tiger-nose grille. No wonder the Sportage looks so different! The second good reason to consider the new Kia Sportage is the Insurance Institute for Highway Safety (IIHS), who have bestowed its 'Top Safety Pick' award to the new Sportage. See the whole family of 2016 Kia Sportage SUVs in our showroom at Lebanon, Crossville, Mcminville, Franklin, and Chattanooga in Cookeville, TN, where we have a wide selection of all three trim levels and many accessories to customize your Sportage. See us first for the sweetest deals and the most committed customer service you will find in all of TN. We proudly serve our neighbors in Lebanon, Crossville, Mcminville, Franklin, and Chattanooga, so everyone is invited for a fun-filled test drive of the 2016 Kia Sportage. As usual, Kia lets you customize your experience with a choice of three trim levels and two different engines. The base trim is the LX, a two-wheel-drive which includes privacy glass, a heated rear window with a wiper, sparkling alloy wheels, and Bluetooth® connectivity. You get a powerful 2.0L four-cylinder engine with six-speed automatic transmission that tops out at 183 hp. It provides more oomph than other SUVs in its class and gives you a respectable EPA rating of 19 mpg city/26 mpg highway/22 combined. Up the ladder is the mid-level EX model which has leather trim, keyless entry and push-button start, humongous 18-inch alloy wheels, a stylish rear spoiler and dazzling roof rails. The top-level Kia Sportage SX boasts an awesome 260-hp Gasoline Direct Injection (GDI) 2.4L engine that lets you zoom past all the larger SUVs and lumbering minivans with ease. The 2016 Kia Sportage is as safe a vehicle as you can find. When the Sportage first came on the scene, it was equipped with just the basic bare-bones safety features - but that was a generation ago! Today's Kia Sportage recently won the coveted IIHS "Top Safety Pick" award, which is no mean feat, considering that the agency has added the rollover crash test to its Top Safety Pick category. You get the latest cutting-edge safety features, like smart airbags and active headrest that yield upon impact. New for 2016 are the amazing airbag sensors that monitor everything inside the cabin (seat occupancy, seatbelt tension, etc.) and deploy the airbags accordingly. That kind of safety package gives you peace of mind, every mile of your journey. Now is the perfect time to check out the Kia Sportage. It looks sportier than ever, and it is a serious contender in the SUV arena. 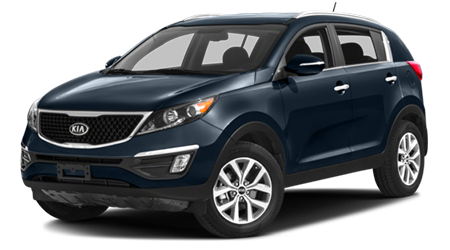 We have a large selection of 2016 Kia Sportage models in all the different trim levels and colors (Be sure to look for the Digital Yellow version.) Our spacious showroom in Cookeville, TN is just down the road from Lebanon, Crossville, Mcminville, Franklin, and Chattanooga, so please drop by soon!